Last summer marked the passing of someone very important to the local comics community here in Minnesota. 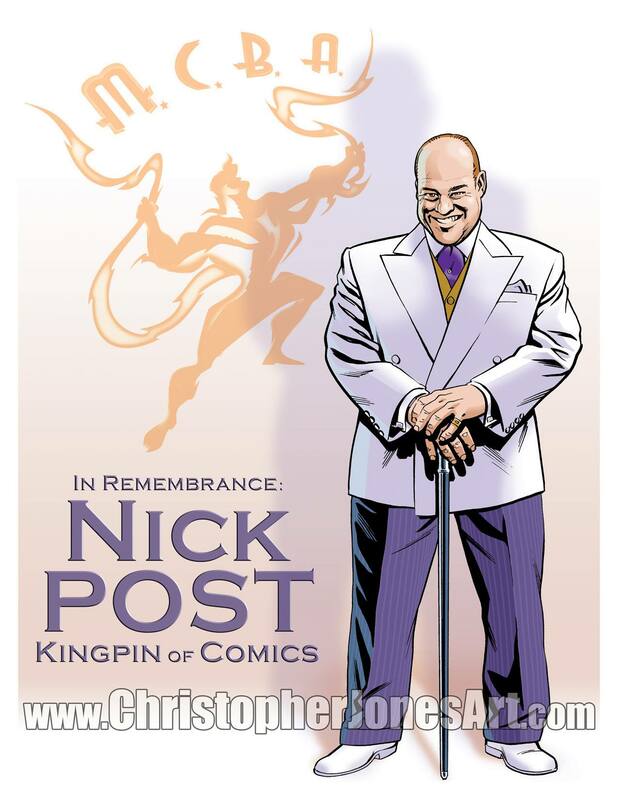 Dominic Postiglione (Nick Post) left us all too soon, and I still find myself mourning him frequently. You see, Nick was a larger-than-life personality, driven by a deep passion for comics. He was a steadfast supporter of local talent, always happy to use his resources as an organizer of the Midwest Comic Book Association (MCBA) conventions or as one of the owners of Source Comics and Games to help struggling creators out. Nick had been an enduring presence in my life since the early days of my comics career. It was one of Nick’s MCBA conventions where I first set up at a table at a con. Nick gave me the chance and treated me as an established professional even though I hadn’t yet earned any clout. That made a lasting impression on me and generated a great deal of my loyalty to Nick and MCBA. I’d never had the opportunity to get to be really close friends with Nick. I was always seeing him fleetingly at comic book conventions—either one of the MCBA shows he organized or at one of the other conventions where Source Comics and Games was exhibiting. Grabbing dinner with Nick outside of a convention was a rare treat, and the time he joined some friends and me for an hour in the hotel bar one convention weekend is still a source of oft-told tales. When Nick passed last year, it was a shock that hit me surprisingly hard. Nick had been a constant presence in my career. I looked forward to sharing milestones of progress with him or picking his brain about things I was trying to work out. He seemed like the kind of giant who would go on forever. I know I wasn’t alone in the way I felt about Nick, so I’m sure his legacy will go on forever. But I still miss you, Nick. I had been tossing around the idea of drawing Nick as Kingpin for a while before he left us. It just seemed so . . . right. And amusing. And perfect. This week, I finally did it. I will have prints of this available exclusively at MCBA’s MSP Comicon this weekend. 100% of the sales of this print will be donated to the Lupus Foundation of Minnesota, Nick’s charity of choice and one of the charities MCBA cons support. Dominic Postiglione, Nick Post, the Kingpin of Comics. 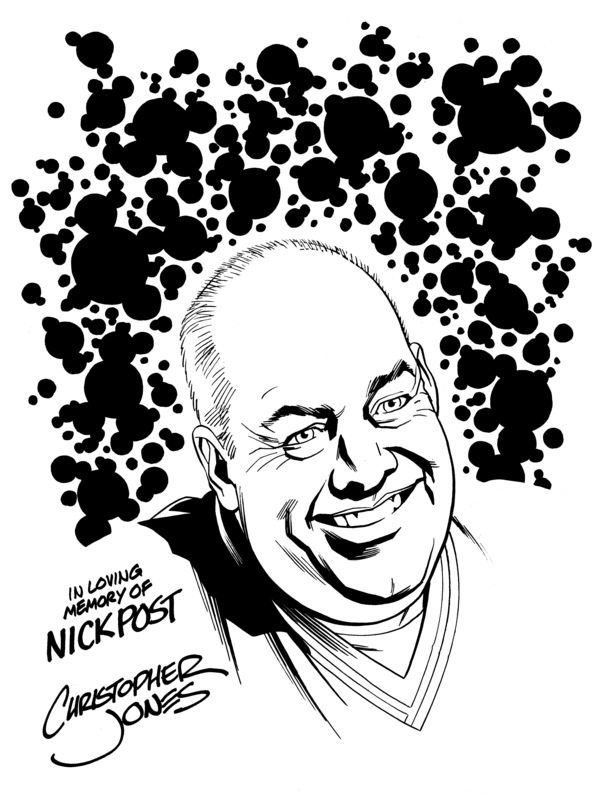 I drew this portrait of my friend Nick Post (Dominic Postiglione if you want to be formal) who passed away this past week for a tribute to him in the upcoming Parallel Man comic book I’ve been drawing. Nick had been very supportive of this homegrown Minnesota-based project, which should come as no surprise to anyone who knew him. I’ve never known a more passionate supporter of the local community of comic book fans and creators. Nick was co-owner of The Source Comics and Games and the driving force behind the long-running MCBA comic conventions (Fallcon and Springcon). I can count on one hand the times I had a chance to have dinner with Nick or otherwise see him outside of a convention or an event at The Source. But for over 20 years Nick had been a regular presence in my life, always greeting me with a smile and always eager to support any project I was working on. Every year when I showed up for Fallcon and Springcon I made it a point to seek out and have a chat with Nick. Those conventions have always been very special and considered must-not-miss appearances on my annual calendar. They were the first conventions I ever attended as a professional, and I was always treated *professionally* there even when I was just starting out and was an absolute nobody. I’ve always felt extraordinarily well treated by all the volunteers and staff at MCBA shows, and I don’t hesitate to attribute that to Nick who led by example. I’m going to miss Nick so much and am sad to think how conspicuously absent he’ll be at Fallcon this year. But I’ll console myself in looking at those ongoing conventions as part of Nick’s legacy. I’m sure others will step up to not only run them but to help welcome the next generation of comics fans and creators to the fold. It’s what Nick would want.